Textile skills in Latin America center chiefly on the creation of clothing Throughout its long history, New World native costume has continued to evolve, absorbing new features, yet incorporating elements of ancient cultures in sewing, embroidery, knitting and weaving. Before the Spanish conquests, intricate textiles were present in occasions both grand and mundane; from offerings to the gods, to priestly adornment, to serving as dowry payments, to swaddling a newborn child, or to wrapping a deceased member of society in preparation for the Afterworld. During the Spanish Period, European methods of textile production were introduced, though simultaenously, native modes of dress were discouraged, if not absolutely forbidden. Following the independence of Latin American countries from Spanish rule, indigenous textile arts experienced a re-birth, blending modern and traditional aspects of the craft. 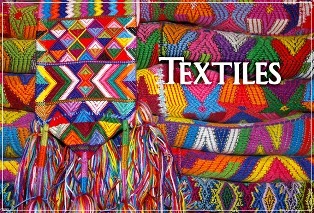 Within various regions, highly specific techniques, colors and patterns evolved within the scope of costume, making individual articles of clothing the very definition of place. Time marches on, however, and these distinctions are becoming blurred, sometimes vanishing altogether. As a result, fine examples of indigenous folk art textiles are story unto themselves.